Following the highly acclaimed Collected Poems of Ted Berrigan, poets Alice Notley, Anselm Berrigan, and Edmund Berrigan have collaborated again on this new selection of poems by one of the most influential and admired poets of his generation. Reflecting a new editorial approach, this volume demonstrates the breadth of Ted Berrigan’s poetic accomplishments by presenting his most celebrated, interesting, and important work. This major second-wave New York School poet is often identified with his early poems, especially The Sonnets, but this selection encompasses his full poetic output, including the later sequences Easter Monday and A Certain Slant of Sunlight, as well as many of his uncollected poems. 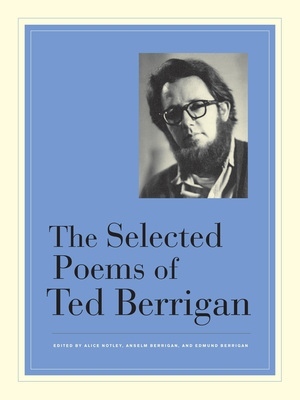 The Selected Poems of Ted Berrigan provides a new perspective for those already familiar with his remarkable wit and invention, and introduces new readers to what John Ashbery called the “crazy energy” of this iconoclastic, funny, brilliant, and highly innovative writer. Ted Berrigan (1934–1983) was the author of more than 20 books, including Bean Spasms, with Ron Padgett and Joe Brainard; Red Wagon; and A Certain Slant of Sunlight. Alice Notley’s numerous collections include In the Pines and Grave of Light, winner of the Lenore Marshall Poetry Prize. Anselm Berrigan is the author of Free Cell and many other works. Poet and songwriter Edmund Berrigan is the author of Disarming Matter and, most recently, Glad Stone Children.